Instant Pot Meatloaf and Mashed Potatoes is an easy and delicious dinner that is ready in less than one hour. This is one of the best comfort foods cooked at the same time in the pressure cooker. In a large bowl combine all the Meatloaf ingredients together, adding the ground pork, beef, and cheese at the end. Mix thoroughly. Then, shape into an oval that will fit into the instant pot. Make a boat out of foil and place the meatloaf inside, it should hug it nicely, but do NOT cover it with foil. Clean, peel and dice the potatoes and add them to the bottom of a 6qt Instant Pot. Add the broth, salt, pepper, and butter. Place a long-legged trivet on top. Add the aluminum boat with the meatloaf on top. Do NOT cover the meatloaf with foil. Lock the lid and make sure you pint the valve to Sealed. Cook on High Pressure for 20 minutes. Followed by a 10 minutes Natural Pressure Release. After that release manually the rest of the pressure. 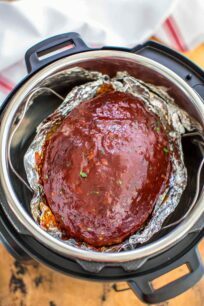 Gently remove the Meatloaf from the pressure cooker and place on a baking sheet, still in the foil boat. Push it down so it doesn't cover the sides of the meatloaf. Next, in a medium bowl mix, all the Glaze ingredients and add pour half on the meatloaf. Brush it to cover the top and sides. Bake it for 10-15 minutes. Brush with the remaining glaze and remove from the oven. In the meantime, with the Instant Pot on Saute, mash the potatoes, add the cream and stir to combine. Turn off and stir in the sour cream. Taste and adjust for salt and pepper. Slice the meatloaf and serve over mashed potatoes with more glaze if desired. Garnish with fresh chopped parsley.